Desert Eagle Towing offers fast and affordable towing services for all vehicle makes and models in the Mesa area. Their team is committed to delivering the best possible local towing service and an affordable rate. With a history of providing expert and damage free towing, Desert Eagle Towing is dedicated to complete customer satisfaction on every call. Call their dispatch center now at 480-440-2165. Desert Eagle Towing specializes in providing fast and safe 24hr towing services to all area highways and Routes. 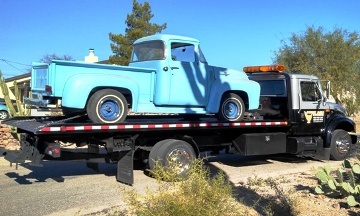 They can provide immediate response towing to your disabled vehicle on Loop 101, Loop 202 and US 60. With the fast response local towing services they can haul your vehicle around the corner or throughout the Valley. Desert Eagle Towing is the most reliable local towing service and is committed to your 100% satisfaction. They can provide towing for collector cars, show cars, classic cars and luxury vehicles of all types.